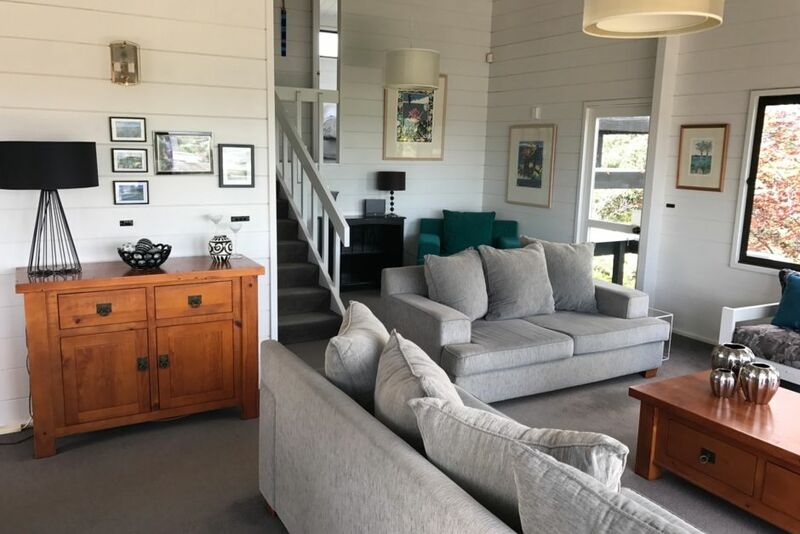 This stunning home is set on 2 levels in Oneroa with multiple sea views. The main living area is on the upper level, with an open plan and spacious living and dining area, and fully appointed kitchen. Large ranch sliders open up to the expansive and sunny decks from both the living and dining areas, with large windows either side to complete the view. The upper bedrooms each have their own private balconies with views towards the sea. The property has unlimited free wifi. A free vehicle is included when your rent this house for exclusive use by the guests during your stay (excludes petrol). The lower level can be self contained, and is accessed via an internal staircase which can be closed off for privacy. This level has a studio apartment style layout, with open plan living and bedroom, a bathroom and basic kitchenette, and also also has its own deck. This property is only a 5 minute drive from Oneroa Village and beaches, though is hidden away from the hustle and bustle of it all in a peaceful part of the island. Walk down to Sandy Bay, or head out to one of the islands most popular swimming beaches - Palm Beach is less than a 5 minute drive away and Onetangi is a 10 minute drive. Being in such a central location also means you are close to the supermarket and other stores, and is the perfect place to be if you are exploring all the island has to offer. Small, well behaved dogs may be permitted on request - please note that the property is not fully fenced, but is mostly fenced. Smoking is not allowed inside the house. Maximum occupancy is 6 people - the additional adult and child rate does not apply. We had a lovely stay with everything we needed. Close to beaches and township would stay again thanks! Clean and tidy and all the amenities that was needed. My parents from Malaysia truly enjoyed their first time experience in waiheke. Lovely view and very clean. Lovely view and very clean. Beautiful batch. Little bit far from Oneroa town. About 30 mins walking distance and 6 minutes drive.